With Britain facing another six months of Brexit limbo, the costs are stacking up for U.K. industries preparing for the divorce. Companies have been spending millions of pounds on contingency measures across the board, preparing for the worst-case scenario of a chaotic no-deal split from the European Union. It’s been a boon for lawyers, consultants, regulatory agencies and customs agents, but protracted confusion for businesses across industries. 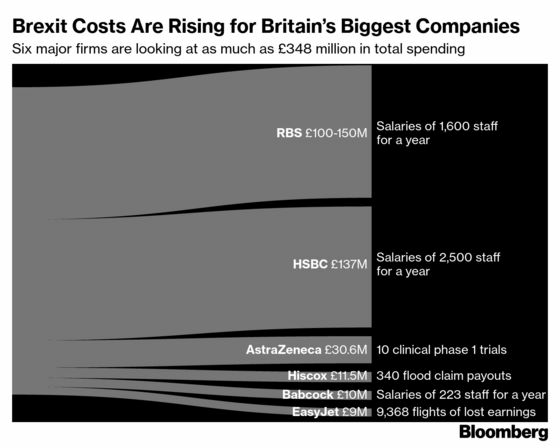 Here’s what Brexit has meant for six major firms and what those costs signify. Royal Bank of Scotland Group Plc expects to spend between 100 million pounds and 150 million pounds ($130 million and $196 million) on Brexit planning, according to a company spokeswoman. It’s applied for new banking licences in the EU and shifted billions of pounds of assets to Amsterdam. With those funds RBS could have paid the salaries of 1,600 staff for a year, about 2 percent of its workforce, based on figures in the bank’s annual report. The calculation assumes the lower range of the Brexit planning estimate and the average compensation of an RBS employee in 2018. HSBC Holdings Plc has spent $179 million on Brexit contingency planning to-date, according to a company spokesman. The bank has established new branches and applied for new licences in the EU. The bank could have paid approximately 2,500 staff for a year with those funds, about 1 percent of its global workforce, assuming the average salary of an HSBC employee as calculated from its 2018 annual report. A spokesman said the cost of hiring also includes IT resources, office space and training. Lloyd’s of London insurer Hiscox has spent $15 million on Brexit preparations, setting up a new subsidiary in Luxembourg so it can continue to serve clients in Europe. That’s akin to an extra 340 flood claims to payout in a year, assuming the average amount dispersed by insurance companies for such claims in the U.S. between 2009 and 2017. That’s according to data from the Federal Emergency Management Agency and Department of Homeland Security. Hiscox could also have paid 190 staff for a year with those funds, about 6 percent of its total workforce, assuming the average salary of a Hiscox employee in 2018. EasyJet Plc has spent 9 million pounds over the last two years preparing for Brexit, opening a new European headquarters in Austria. That’s akin to 9,836 flights of lost earnings, based on calculations from the company’s 2018 annual report. The company flies an average of 1,516 flights per day, so this represents about six days of flying. The airline could have also paid 97 pilots for a year, or 362 cabin crew, with the funds, assuming the average salary for those roles as stated in EasyJet’s 2017 gender pay gap report. Drug-maker AstraZeneca Plc puts its Brexit preparation costs at about $40 million, spent on measures including duplicating testing in the EU, transferring regulatory licences and preparing for new customs arrangements. AstraZeneca could have funded 10 clinical phase 1 trials for new drugs with those funds, assuming an average cost of $4 million per trial. The company could have also paid 370 staff for a year, based upon the average salary of an AstraZeneca employee according to its 2018 annual report. Babcock International Group Plc, an engineering and defense contractor, has spent 10 million pounds setting up separate subsidiaries in Europe to carry on aerial firefighting and search-and-rescue missions. The company could have paid 223 staff for a year with those funds, about 0.6 percent of its global workforce, assuming the average salary of a Babcock employee in 2018.